Cloud computing is here. Powered by mature virtualization technologies, public and private cloud initiatives are implemented at best of breed enterprises. If you're just getting started, users might be wondering why they can get cloud services in minutes, but getting similar services internally is slow and often more expensive. Fixing this gap between the online world and "in-house" world has taken on new urgency. It is now imperative that you provide equivalent services, with equivalent speed, agility, price and performance. Providing cloud services in a structured manner requires a proper governance framework. Turns out ITILv3 and the tenets of IT service management fit quite nicely. 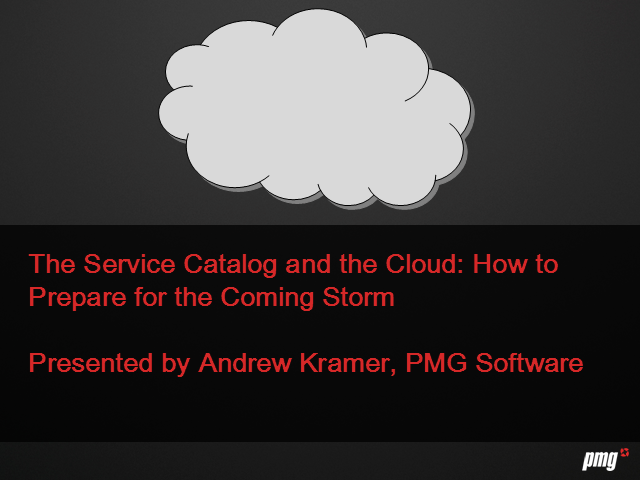 First and foremost, you must provide an online catalog of available cloud services. From self-service, to automated provisioning, to dynamic billing, your service catalog should provide all the components you need to have a best-of-breed cloud computing governance and automation framework. - Making sure you are not too narrowly focused, ensuring you can cover not only VMs, but also include network, storage, and applications.